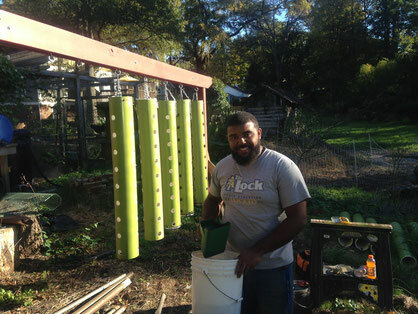 In October 2016, with the guidance and help of Trequan McGee from A&T's Urban Horticulture program, I started a long overdue project n creating a hanging strawberry growing system. I wanted a system that was a more efficient use of space, was easier on my back to maintain, and was a LOT easier for harvesting - hence the growing zone would be limited to a space running between my knees and head height. I have seen vertical towers placed in the ground but that seemed to have a few downsides. Ground contact meant easier access for strawberry predators. If I wanted to collect the water runoff it would be a problem, I would be putting a LOT of the pipe in the ground in order to have a stable and accessible growing zone. Finally, as a low priority, it could not be moved with any ease. On a trip to the UK I had noticed a lot of horizontal strawberry growing in tunnels. Ease of maintenance and my back was certainly higher, and water use and capture would be easier, but it seemed a little less efficient in space. So I came up with this hanging solution. The system runs from north to south and each is on a swivel hook so I can turn them once a week to allow for better sun exposure. Each tower is a 4 foot piece of 6" pvc each with three rows of 9 holes each, 7" between rows, and holes on 4.5" centers. That means each pipe holds 27 plants. The bottoms have clamped onto them a mesh to allow drainage, with the option to replace them to enable runoff capture and perhaps recycling. We installed a 14' beam that enables me to have 11 pipes (though I've only currently got 10) for a total of 270 plants in 14 linear feet, with a 8 inch width. By comparison there is a row of strawberries below them that has 12 plants - a 20 to one space use! Initially I painted them green for sun protection and aesthetics, but changed that later and some are painted red to see it the color use has an impact on fruit production. With the help of two more wonderful A&T Urban Horticulture students, James and William, we sunk in the ground next to it a 40 gallon rain barrel and installed a pump to enable drip irrigation, and eventually recapture. Over winter they were not planted, but Trequan and I had set up four different growing media to assess the impact on water and temperature. Over the winter I found different impacts but thankfully had not planted them when one morning I went outside and found the temperature in the tubes was 27F - pretty much the ambient air temp at the time. My next post will discuss plant selection and the four different mixes, and what I have reduced them to. Thank you for your post! I would recommend to drill holes for watering only on 1st 10 cm of the watering pipe.